M. Wells Dinette horse meat scandal: Why horse meat is more dangerous than you think. 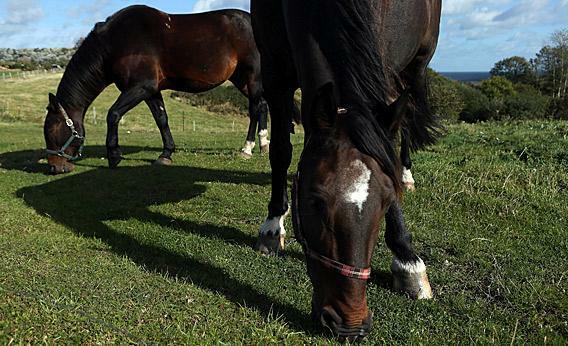 A New York chef planned to serve raw horse meat. It would have been a disaster—but not for the reason you think. Photograph by Sean Gallup/Getty Images. At Brooklyn’s Great GoogaMooga food festival last May, Hugue Dufour, the noted chef who’d co-founded the acclaimed M. Wells Diner, sold 5,000 grilled-cheese sandwiches that created quite a buzz among New York foodies. That’s because Dufour’s creation was stuffed with foie gras, pork fat, and—the rogue ingredient that titillated adventurous eaters—horse meat (mixed with pork to make bologna). Consider the supply chain. In 2011, almost 140,000 horses from the United States were sent to slaughterhouses in Canada and Mexico. (The last American horse slaughterhouse closed in 2007.) Many of the horses that landed in these across-the-border abattoirs were thoroughbreds from the U.S. horse racing industry. Others came from prolific quarter horse breeders, who send horses into racing, ranching, and rodeos. Racing in particular is a controversial business marked by overbreeding, early racehorse retirement, and extensive drug use. (The New York Times has laid bare the harrowing evidence this year in an excellent series called “Breakdown: Death and Disarray at America’s Racetracks.”) Indeed, many racehorses essentially become pharmaceutical dumping grounds throughout their artificially stimulated, sedated, and numbed lives. The chemicals that course through the blood and lodge in the flesh of many thoroughbreds and quarter horses might ease their pain and treat their diseases, but they also make these animals distinctly unfit for a GoogaMooga sandwich. The irony here is instructive. American consumers—especially the kind that attend food festivals that serve horse sandwiches—are, as a rule, deeply opposed to the way factory farms saturate confined animals with growth hormones, vaccines, and antibiotics. But the medications turning them off conventionally produced meat are at least regulated—unlike the toxicological residue in horse flesh. Until horses are specifically raised for their meat, and effectively regulated by the USDA as a discrete food product (both of which I hope never happen), this situation is unlikely to change. As matters now stand, the horse-racing industry, which is notorious for its reliance on overmedication, is a driving force behind the production and oversight of horse meat. Few aspects of the global food system are more absurd—the horse industry, after all, has about as much interest in safe food as the coal industry. To wit: A single racehorse’s personal history of drug use almost certainly includes Banamine (an anti-inflammatory), Clenbuterol (a steroid), Ivermectin (dewormer), and Lasix (an anti-bleeding drug), and might also include snake venom (which deadens nerves in horses’ joints) and other steroids (which are banned but still sometimes used by unscrupulous vets). Trainers and veterinarians, needless to say, aren’t thinking about human health when they administer these medications before the bets are placed and the gates are opened. Let’s hope the USDA gets a rigorous inspection system in place. But critics of equine slaughter still have their concerns. According to John Holland, who co-founded the anti-horse-slaughter nonprofit Equine Welfare Alliance, “American horses receive over 100 medications that are not permitted in food animals.” Dr. Lester Friedlander, a former USDA veterinarian, told me that safe horse meat was unlikely because “chances of there being bute in the horses are very high and bute is not approved for human consumption by the FDA.” Vickery Eckhoff, a reporter for Forbes who has extensively covered the issue of horse slaughter (and who probably knows more about it than any other working journalist), recently called the USDA to ask how they might deal with phenylbutazone. The representative with whom she spoke had never heard of the drug, and even had to ask how it was spelled. It’s tempting to suggest: i-m-p-e-n-d-i-n-g d-i-s-a-s-t-e-r.